This is one of those rare times where I post something somewhat serious. It's still quirky....different, interesting, not quite the norm....but serious, no less. I first saw this a couple months ago and I'm still amazed that someone actually thought to put together an ad like this. I'm impressed really, but a little saddened that it's such an issue that there's even a need for them. 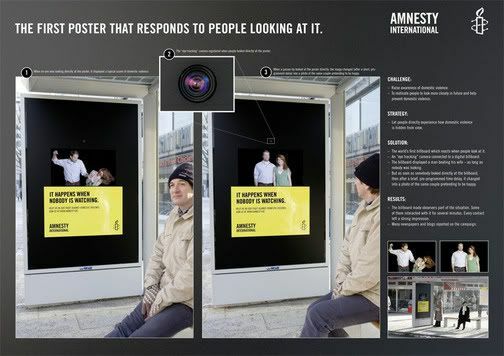 It's the first poster that actually responds and reacts to people looking at it. When a person is looking at the poster, there's a perfectly normal, loving couple, but when the person looks away, the woman is being beaten. It's quite a shocking way to get the idea across, but it makes perfect sense, too. Domestic violence happens when you're not looking....both in people's homes and on these posters. There's a brief delay with the switch so that people actually know what's going on instead of having to sneak a peek out of the corner of their eye. Kudos to the designer. Wow @ it's amazing way to spread the awareness about domestic violence.